Fluidampr harmonic dampers have developed an enviable worldwide reputation. The crankshaft damper has to control the torsional harmonic vibration of the crankshaft after every cylinder firing. Although these harmonics occur over a broad range of engine speeds, the conventional elastomer-type dampers are frequency sensitive – working efficiently only within a narrow rpm range. The success of the Fluidampr is that it utilises a unique viscous silicone fluid to control all harmonic vibration at all rpm. Fluidampr responds to the amplitude (intensity) of crankshaft vibration, regardless of engine speed or the frequency at which it occurs. Fluidampr offers maximum control of all engine harmonic vibrations in any performance race or street engine. The resulting benefits of the Fluidampr are increased bearing and crankshaft life, increase in horsepower due to reduced spark scatter and variations in crank timing, is laser welded / sealed, so requires no service, quiet in operation and improves valve timing accuracy by reducing torsional vibrations transferred to the timing set. The timing marks are stamped at 2-degree intervals on the laser-welded housing (which cannot slip). Fluidampr are SFI approved and safety tested to be explosion proof at 12,500rpm. Dyno proven to reduce crankshaft vibration by 50% compared to leading aftermarket elastomer dampers. This 7 1/4" damper is designed to fit 283-350 CID V-8, 90 degree V-6, & all internally balanced custom built large displacement Small Block V8’s. Will not fit 1992 & later LT1’s. 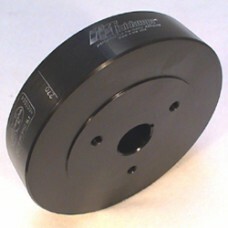 This part is also useful to customers wishing to adapt a Fluidampr part to their own application. In this case the customers would either, remove and machine the existing hub or manufacture their own crankshaft hub and then use the damper ring bolted to the hub.